1. RELAXATION THERAPY: Search for a calm environment, turn off the lights (photophobia, or light sensitivity, is a common migraine complaint), minimize sound/noise (due to “hyperacusis”), and sleep if possible. Monitor the room temperature and/or use hot/cold compresses to the head and/or neck regions to relax tight muscles (heat) and reduce pain and swelling (cold). Similarly, a warm shower or bath can have similar beneficial effects. 2. SLEEP WELL: Migraines can interfere with falling asleep, they can wake you up during the night, and they are often triggered by NOT getting a good night’s sleep. To improve your sleep quality: a) Establish regular sleeping hours. Wake up and go to bed at consistent times every day, including weekends. b) Keep daytime naps short (20-30 min. max). c) “Unwind” at the end of the day – try soothing music, a warm bath, or reading a favorite book (avoid suspenseful movies). d) Don’t eat/drink too much before bedtime as heavy meals, caffeine, nicotine, and alcohol can interfere with sleep. e) Don’t exercise intensely before bedtime (stretching is fine). f) Eliminate distractions in the bedroom, including TV and bringing work to bed. Close the bedroom door and use a fan to muffle out distracting noises. g) If you take any medications, check for known side effects, as many contain caffeine or other stimulants that can interfere with sleep – including some meds that treat migraines! Talk to your doctor and pharmacist! 3. EAT WELL: Be consistent about when you eat and don’t skip meals (fasting increases the risk for migraine). Keep a food journal to figure out your migraine triggers and avoid foods that commonly trigger migraines like chocolate, aged cheeses, caffeine, and alcohol. Try eliminating these and see how you feel! 4. 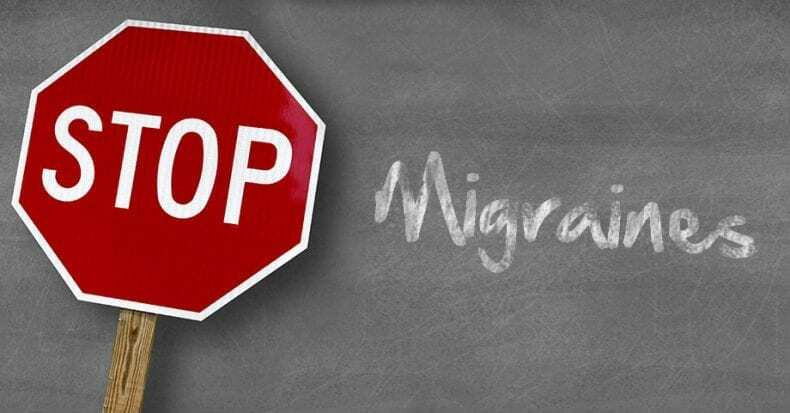 EXERCISE REGULARLY: This is MOST IMPORTANT for migraine management as it facilitates sleep cycles and stimulates the release of endorphins and enkephlins that help block pain. It also helps fight obesity, which is another risk factor for headaches.